Yes, that BLOODY MURDER. It changed my life forever. Let me take you back to 2001, to a time when a younger Nick loved browsing the horror aisle of his local Blockbuster Video. I think you know the time. We all had that time. I was really -- for the first time -- starting to give B-movies a chance. B-slashers, at that. 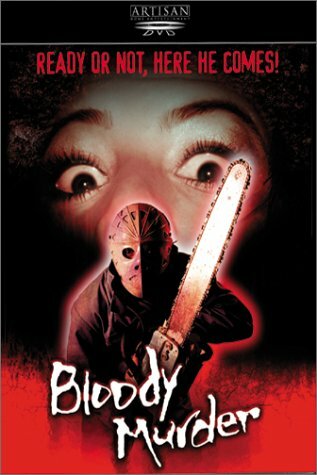 I was already well-versed in the FRIDAY THE 13TH franchise, so it's a no-brainer that a VHS box cover sporting a maniacal killer wearing a hockey mask and brandishing a chainsaw caught my attention. Sold. Well, rented. I had to see it. If memory serves, I also remember grabbing one of the giant tubs of Rasinets that were at Blockbuster. So, yeah, after getting home, I ran upstairs to my bedroom, drew the shades, slid the videocassette into the VCR and sat up on my bed with my giant bowl of chocolate-covered raisins on my lap. The movie started. Oo, a night shot! A lone car on a desolate road runs out of gas. Eerie, right? The male driver leaves his pregnant wife behind as he goes to get more gas and he leaves into the darkness. The man comes up to a parked truck. Another man stands next to the truck. The gasless man asks for the help and the shadowy figure gets something out of his truck and walks to the front. 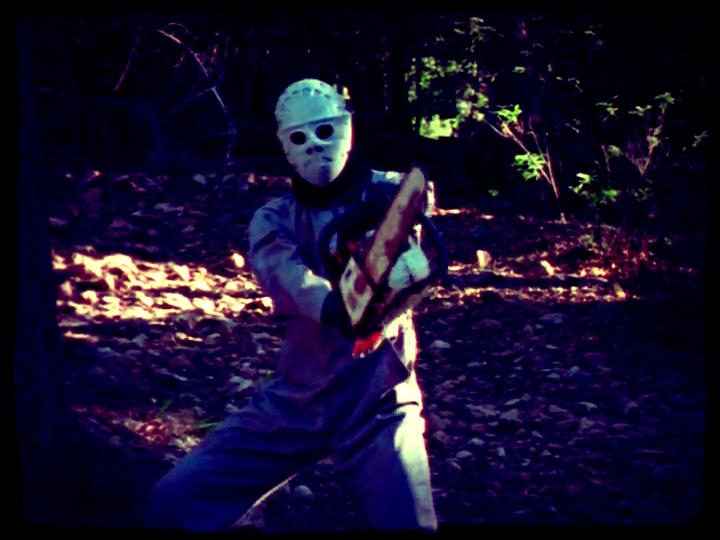 Holy hell, it's a guy in a hockey mask with a chainsaw. Hook, line and sinker. I'm in! The movie played on. It didn't matter how bad the movie was or that the majority of this horror film took place in broad daylight. The opening already had me. Now it's not that the opening was good, by any means. But, it intrigued me. Looking at the cover art, yeah, this is an obvious F13 ripoff. And when I finally saw the reveal of the killer, I still had that sentiment, but I thought that maybe this could be something different. Perhaps this is a new horror icon who just happens to like hockey masks as well. The movie was horrible. That, I knew. But I loved this movie for some unknown reason. It was so bad it was good. Kind of like TROLL 2. And it changed my life forever. The bad acting. The stolen premise. It all equaled one thing. It told me that I could make movies one day. Movie making wasn't an impossible feat. I've since come to love the acting, the atmosphere, the setting, everything. Every little bit of this movie puts a smile on my face. 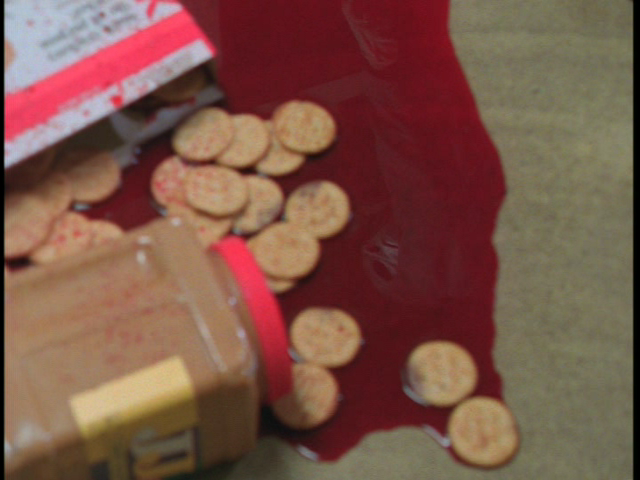 And in 2003 BLOODY MURDER 2 came along. Yes, it got a sequel! That sort of tells me that perhaps I wasn't the only one who was suckered in by the cover art. BM2 was basically a re-do of the first film, and it's apparent that the BM1 script was used for the template while making the sequel -- but obviously improving in just abut every category -- more blood, [slightly] better acting, some T&A...oh, and some Tiffany Shepis. This led me to starting the world's very first, but not only, BLOODY MURDER website (Bloody-Murder-Films.com). I admit that I don't watch the film as much as I used to, but I do occasionally throw the DVD in, even if it's just background noise. The DVD is now out-of-print, but if you can track down a copy, buy it! The director's commentary is gold. Luckily I own both a VHS copy and DVD. Now let's all go sit around a campfire in the middle of the woods, talk about camp lore and play a deadly game of BLOODY MURDER. Here's a cheesy scene from the movie.